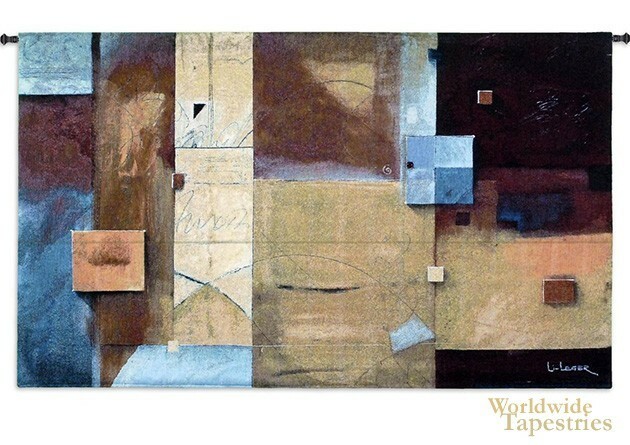 This tapestry 'Poet's Cause' is based on the work of artist Don Li-Leger. A contemporary artist of abstract pieces, Li-Leger's work has been acclaimed internationally. This piece here demonstrates Li-Leger's love of color and superimposition of shapes and form. The play of color, including their shades and subtle highlights, with the use of shapes to anchor floating ideas onto the scene, an abstract scene is suddenly created. This work makes the most beautiful use of blues, browns and golds. This tapestry 'Poet's Cause' is backed with a lining and tunnel for easy hanging. Note: tapestry rod and tassels, where pictured, are purchased separately. Dimensions: W 52" x H 31"
Dimensions: W 88" x H 52"